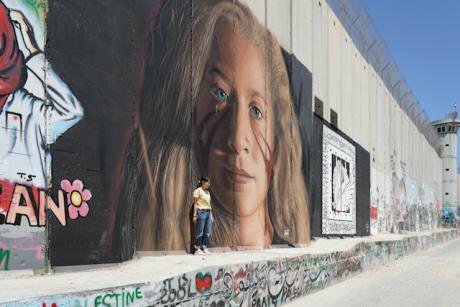 Ahed Tamimi on the wall of separation in Bethlehem. Picture by: Richard Gray/EMPICS Entertainment/PA images. All rights reserved. Ahed Tamimi, the new blond icon of Palestinian resistance, who was released on 29 July 2018, after spending eight months in Israeli prison, raises for Israelis the tormenting question: can a Palestinian be (genuinely and legally) blond? The widely circulated images on social and mainstream media of the defiant Ahed Tamimi, a 16 years old girl with blond hair and blue eyes surrounded by heavily armed big dark-skinned Israelis (Israeli soldiers from the Givati Brigade and later members of the Israeli police force who are usually Mizrahi) is a big blow not only to the Israeli well-oiled propaganda (hasbara) machine but also, and perhaps even more crucially and dangerously, to its self-image or the way it perceives itself and would like to project itself to the so called western public and media. Are not the Israelis the fair-skinned enlightened westerners and the Palestinians the dark oriental barbarians? How dare the Palestinians have blond ambition? How do they have the chutzpa to invert the light/dark formula so deeply ingrained in the Israeli psyche as well as in the western public imagination? A telling anecdote regarding this formula is the confusion that was caused at the 1984 Venice Film Festival when the blue-eyed Blond Muhammad Bakri who plays Issam Jabarin, a Palestinian resistance fighter in Uri Barabash’s Beyond the Walls (1984), was taken to be the Israeli Jew and the dark-skinned Arnon Tzadok, an oriental Jew who plays Uri Mizrahi, an Israeli Jewish criminal, was mistaken for the Palestinian. For the western, and particularly American, consciousness, the “blond icon of resistance” to the oppression and destruction of Palestine was Rachel Corrie, an American member of the International Solidarity Movement (ISM) who was killed in Rafah in the Gaza Strip by an IDF bulldozer when she was standing in front of a local Palestinian’s home, thus acting as a human shield, attempting to prevent IDF forces from demolishing the home. The unsettling blond resonance between Rachel Corrie and Ahed Tamimi disrupted Israel’s mission to be the blond spearhead of the west in the Middle East. Blondness is part of this identification mechanism. To be blond is to be identified with the west and, therefore, the new Jew is assigned the role of the white of the Middle East. It is important to mention in this context that the cult of blond in Israeli culture has even deeper historical roots. In traditional Eastern European Jewish literature the blond Shiksa (non-Jewish woman) is the fantasized object of desire for the dark Jewish man who, in the European mind, historically (though not now) has not been perceived as white but as oriental and even black. Furthermore, blond is also a cultural performance that under specific circumstances (like Nazism) became a demarcation line between life and death. Aryan looking Jews (i.e. blue-eyed blonds), particularly in Warsaw, had more chance to escape encampment in the Ghetto and consequently deportation to concentration and death camps, by living as blond Poles in the Aryan side of the city beyond the Ghetto walls. As such, in the post-Holocaust Jewish imagination blond has been perceived as a signifier of survival. In her book Lama Lo Bat Lifnei Ha’milhama (1998, Why Did Not You Come Before the War), Lizi Doron describes how her Holocaust survivor mother, who was saved from death on several occasions because she took great care to peroxide her hair, forced her since she was a teenager to dye her hair blond. For her mother, blond was a ticket to life, a guarantee of survival. It is not surprising therefore, that Israel has one of the world’s highest percentages of women dying their hair blond as well as having plastic surgeries to change the shape of their “Jewish” nose. Their ultimate goal is to achieve an “Aryan” and “non-Jewish” look. Mizrahi Jewish women, on the other hand, dye their hair blond to look more Ashkenazi and to mask and hide their dark oriental roots. The racialisation of blond, thus, operates on many levels in Israeli society and is related to a complex and multilayered structure of oppression. Being blond in Israeli culture is also associated with the myth of the Sabra, the incarnation of the new Jew. The Israeli heroes of Amos Oz, particularly in his early literary work, are almost always handsome blue-eyed blonds. Elik - the protagonist of the Israeli writer Moshe Shamir’s Bemo Yadav (With His Own Hands, 1954) is considered by critics and scholars to be the prototypical Sabra in the literature of the Palmach generation, a mythic Sabra, a Rousseau-like “noble savage” born from the sea, who, like Sandro Botticelli’s Venus in Birth of Venus boasts a crown of golden hair. Blondness, as Kathy Phillips writes in her book on blondes, suggests, among other things, lightness and the glow of gold, a crowning glory invoking heavenly luminosity or even a solar radiance. This conception of blond, ingrained in western culture, is most notably manifested in Italian Renaissance paintings. As I previously demonstrated Israel deliberately selected a team of peroxide blonde women as their masbirim (misinformation spokespersons) so as “to project a feminine and softer image” during their 2008-9 attack on Gaza. But the Jewish State’s attempt to monopolize blond for its war against the Palestinian people was sabotaged by Ahed Tamimi, a young girl with a blond ambition and a big chutzpa. In today’s world the desire for blondness reflects the balance of world power. The west is associated with blond, and therefore blond is associated with power. Ahed Tamimi is a powerful icon of resistance and it is therefore not so surprising (though, obviously, infuriating) that Ben Caspit an Israeli journalist in Maariv, one of Israel’s major newspapers, suggested that “in the case of the girls, we should exact a price at some other opportunity, in the dark, without witnesses and cameras”. Yet, as in the famous Banksy’s image of a girl in a pink dress searching an Israeli soldier with a machine gun laying to his side and leaning against the Apartheid Wall the role reversal enacted by the Banksy girl and echoed by the defiant young blond girl Ahed Tamimi invites us to reflect on, or rather to resist, the ongoing failure of Israel to recognize the humanity of others.